Today you have a free morning to explore Edinburgh, the capital of Scotland and one of the world’s most fascinating cities. 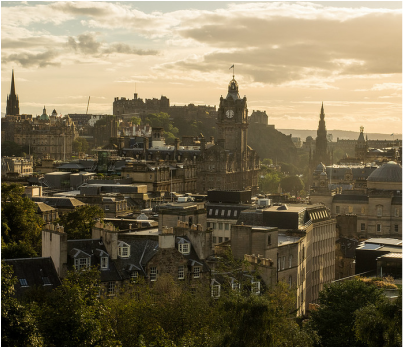 Situated on a series of hills, Edinburgh is often called “the Athens of the North.” The Old Town and New Town sections are a UNESCO World Heritage Site. Princes Street, the main thoroughfare, is perfect for sightseeing, strolling and shopping. In the afternoon, visit Edinburgh Castle—the city’s most famous sight—and have tea in the Castle Tea Room after exploring this ancient fortress, built on the site of an Iron Age fort. After breakfast spend the day exploring Edinburgh. If you are interested in genealogy and Scottish ancestry, visit Scotland’s People Centre, the largest family history center in Scotland and home to the National Record of Scotland. It’s located in the heart of the city and has one of the best collections of archives in Europe. Art lovers should explore the Scottish National Gallery and National Portrait Gallery. Book lovers can search out the Writer’s Museum, near the Royal Mile, where you can find manuscripts from Sir Walter Scott, Robert Louis Stevenson and Robert Burns. After breakfast, pick up your rental car and head north across the Forth Road Bridge. Travel through the Ochil Hills to Perth, the former capital of Scotland, beautifully situated on the River Tay. Time permitting, visit Scone Palace where once Kings of Scotland were crowned. Continue on to Pitlochry and have lunch in this charming town. Visit the Edradour Distillery, the smallest and most picturesque in Scotland, and have a “wee dram” or two while discovering the secrets of whisky making. Continue north to the Highlands of Scotland, to the region known as Royal Deeside, due to its many connections with the Royal Family. After a nice breakfast, drive along the Castle Trail, which takes in 17 unique castles, ranging from clifftop ruins to grand fortresses to Royal residences. 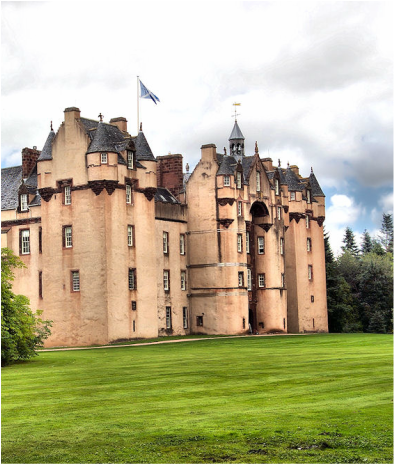 ​Among those you’ll see are Drum Castle, dating to the 13th century; Crathes Castle, a fairy tale castle with a graceful tower and beautiful walled gardens; and Fyvie Castle, a stunning 800-year old fortress with many legends, folklore and ghosts. Continue through the picturesque Spey Valley, home to seven working whisky distilleries on the Malt Whisky Trail, including a fascinating cooperage where whisky barrels are made. Continue driving towards Inverness, the capital of the Highlands. Explore the city, which features a castle with beautiful grounds, a cathedral on the River Ness, and an informative museum. ​Day at leisure to explore. Be sure to see Loch Ness and also the dramatic ruins of Urquhart Castle, perched above the loch. You will also have your 2-Hour Loch Ness Boat Cruise today, which starts at the Clansman Hotel Harbor directly on the loch. Time permitting, you can take a short drive to Culloden Moor, site of the 1746 battle in which Bonnie Prince Charlie and the Jacobites were massacred, ending Scotland’s drive for independence from England. ​After breakfast at your hotel, drive along the shores of Loch Ness to Fort William, situated at the foot of Britain’s highest mountain, Ben Nevis. Visit Glencoe, which in Gaelic means “valley of tears;” it’s one of the most famous and beautiful of all Scottish glens, with high mountain peaks, rushing rivers and magnificent waterfalls. Continue along the West Coast and Loch Linnhe to Oban, a quaint fishing village and the departure point for ferries to the Hebrides Islands. Today you’ll take a day trip to the scenic Isle of Mull via round-trip ferry. With only 2,800 inhabitants, spectacular sea cliffs and rocky coves, Mull is an ideal place to see a variety of wildlife. Red deer roam the hills and wild white goats can be found. Mull is a great place to see birds of prey, including golden eagles and the majestic sea eagle. Head to the rugged Mull coastline to spot dolphins, Minke whales and porpoises. In the late afternoon, return by ferry to Oban. After a leisurely breakfast, drive south to Crianlarich, and then follow the shores of Loch Lomond, the largest and perhaps most beautiful of all Scottish lochs. Arrive in Glasgow and spend the rest of the day exploring Scotland’s largest city. Glasgow is a UNESCO City of Music and will host a program of musical events throughout the year. Charles Rennie Mackintosh, Scotland’s most famous architect, designed the Glasgow School of Art’s main building on Renfrew Street. The Kelvingrove Art Gallery is one of Europe’s great art collections, featuring paintings by French Impressionists, the Dutch Masters, and Salvador Dali’s “Christ on the Cross". After breakfast, drive to Glasgow or Edinburgh Airport to return your rental car before your flight, or start on your next adventure. READY FOR A SCOTTISH ADVENTURE? LET'S TALK!